The shoulder is a free moving joint, leaving it vulnerable to injury. Timely Chiropractic Care for Shoulder Pain Can Help You Avoid Surgery! There are many different soft tissues in the shoulder including ligaments, tendons and muscles. Each of the has the ability to be compromised by improper notion or overuse. These soft tissues all work together to create the movement and strength.required for proper function, making diagnosis of the troubled area more difficult. The shoulder is a significant referral site where pain may occur from injuries or conditions existing in other parts of the body, such as the neck, lower back, hip and legs. Symptoms of cardiovascular disease may also be referred to the shoulder region making the sudden onset of shoulder pain an issue that should be immediately evaluated. Dr. Orlasky is experienced at determining the cause of shoulder discomfort. An in-depth examination will be conducted and further diagnostics may be required to eliminate or confirm the origin. Chiropractic is an excellent resource to consider for creating a care plan to help you throughout the healing process. Has Your Shoulder Pain Persisted Longer Than 4 Days? You Need To Get Chiropractic Care Right Away! We don’t think much about our shoulders until they start to give us pain. Then we realize that we are constantly using our shoulders to lift and extend our arms, to carry, wave and perform numerous other motions and tasks. The shoulder is the most mobile joint in the body and as a result it is subject to a wide range of injuries and conditions. Shoulder problems that go unchecked can lead to lifelong, debilitating issues. Your shoulder is made up of muscles, tendons, ligaments and the shoulder joint. These elements work together to allow proper function, mobility, and strength in the shoulder. 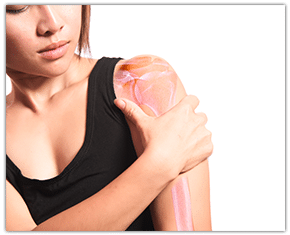 If one or more of these elements are compromised in form or function as a result of an accident or other pre-existing health conditions, they may cause pain in the shoulder. Sometimes, the damage is too big and too painful to be taken lightly. The tendons at the ends of the rotator cuff muscles can become torn, leading to pain and restricted movement of the arm. 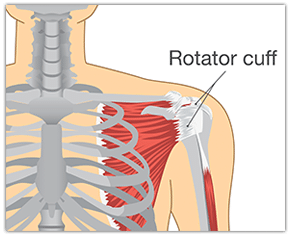 A torn rotator cuff can occur following a trauma to the shoulder or it can occur through the “wear and tear” on tendons. Rotator cuff injuries are commonly associated with motions that require repeated overhead motions or forceful pulling motions. Such injuries are frequently sustained by athletes who throw or use a similar motion such as pitchers, quarterbacks and tennis players. Another common shoulder disorder, also called adhesive capsulitis, where the scar tissue has formed around the shoulder. It is characterized by a dull or aching painand loss of motion or stiffness in the shoulder. The common term for a superior labral tear is an injury to the cartilage that covers the top part of the shoulder socket. This can occur from falling on an outstretched arm but sometimes the cause may be unknown. A patient with this type of injury may have a clicking sensation when they move their arm or pain on the front or top of the shoulder. Impingement syndrome is a common condition affecting the shoulder often seen in aging adults. 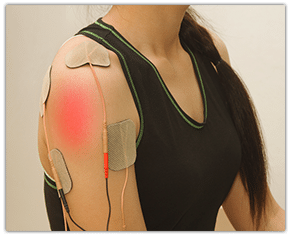 This condition is closely related to shoulder bursitis and rotator cuff tendonitis. These conditions may occur alone or in combination. Chiropractic care is preferred for its gentle, non-invasive, fast and effective methods versus traditional surgeries and medications. 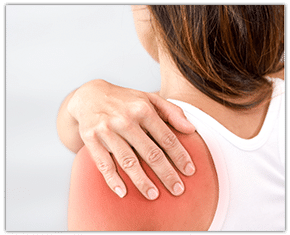 The chiropractors at Comfort Chiropractors are highly trained and experienced in spinal issues as well as the complex shoulder and shoulder pain. The first step in chiropractic care is determining the cause of your shoulder pain through a thorough evaluation. We include using information from your previous medical history as well as advanced imaging techniques to develop your diagnosis. We will then develop a specific treatment plan to ensure a fast and effective recovery.